I cried this morning in the Starbucks. I had to get up and get a napkin to make sure my mascara wasn’t running down my face. I cried because I read yet another article about Caitlyn (Bruce) Jenner. This time, I read about a man named Terry Coffey who was pissed off at the use of the words “brave” and “hero” when Caitlyn is being referred to. Terry didn’t like those terms. 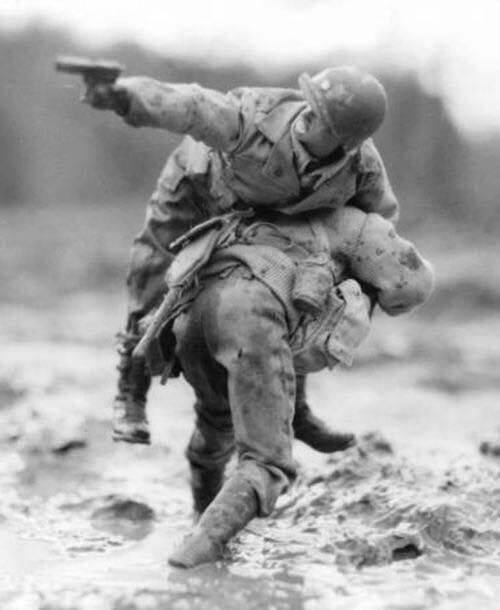 He chose a war picture to post on Facebook which went viral. Men fighting a war is what courage, bravery and a hero looks like to this man. But when he researched the photo further to give the person credit, his trail led to a man who had used the picture as part of coping therapy, which is now becoming a documentary on WWII. The therapy was because the man had been beaten by five men to the point of being in a coma for nine days and had to learn to walk again – for cross dressing. I love it when life gives a dose of serendipity pie. Terry wrote and updated his previous position and didn’t think it was an accident he chose the picture he chose. Not that his 600,000 new friends agreed. They seem to love his original post more. It would be nice if we could just drop the damned labels all around or find a way to accept that one definition of one word will never fit the seven billion people trying to walk a meaningful path in this life. When I watch Caitlyn unfold in the public eye, I do use the word brave. I see a man who was scared. Scared but willing to stand in his truth, let come what may. That’s the thing about a person standing in truth, it’s scary because it changes everything. Every-thing. And that takes courage. When a person decides to tell the world they are different than most of the population, they are standing up for everyone in line behind them that has been kicked down and literally beaten (in many cases to death). I am writing a book about my grandmother’s life. My grandmother was beaten and verbally abused by my grandfather. She had to rise up, learn to drive, get a job, and make changes for herself. She had to escape the fear and live her life, and so did my mom and my aunts. They all had to overcome being torn down mentally and beaten physically. And it was BRAVE. And it took COURAGE. And they are my HEROES for being the kind of women who could do that. And they worked hard so that I could grow up with FREEDOM from fears like those they had to endure. When I write about the generations before me, I see them all standing behind me, lined up and cheering me on to the finish. So what’s Caitlyn’s finish? Who is standing behind her? Maybe a line most people will never see, but there is a line. And I believe she’s brave. I think what she’s done takes courage. And I’m willing to bet she’s taking plenty of metaphorical punches for many people today and those yet to come. Based on the words I’ve read, she is fighting a war – a war on standing in a truth where the outcome is freedom to be truthful to one’s self. Every label out there has more than one meaning, and that is what those words are (even the kindest words are) – labels. And labels are interchangeable and meaningless and meaningful all at the same time. It all depends on who you ask. Today, I strive to let go of the labels I have put on myself and those in my life, and even those of the world. If I do label something or someone, I know that they are just that, labels; that the name I decide to give someone might feel different to me, look different and actually be different, but under the labels we are all the same, one kind, one person connected by one truth that has no label but is called LOVE. This entry was posted in Uncategorized and tagged brucejenner, caitlynjenner, labels, living truth, metaphysical, moms soul cafe, truth. Bookmark the permalink. 3 Responses to What’s in a Label? Beautifully said and so heartfelt. I love your caring nature and tender heart. Wonderful words and insight. Hopefully your example of compassion will lead others to follow. It’s always a joy to experience your gift of expression. Lovely post. All of our fears and obstacles differ. Bravery is someone confronting whatever it is they thought they couldn’t, finding their own courage to overcome.